A new mixed-use trail for walkers, runners, and cyclists is being built within the rail corridor in Cardiff. Construction started at the end of April, 2018 and the trail is expected to be complete in early to mid-2019. The trail will meander through the open space east of the railroad tracks between Chesterfield Drive and Verdi Avenue and then run alongside San Elijo Avenue on the bluff top to Santa Fe Drive. This project is a small part of a larger regional Coastal Rail Trail project that will eventually link Oceanside to San Diego with a continuous bike and pedestrian path. The length of this segment is approximately 1.3 miles. 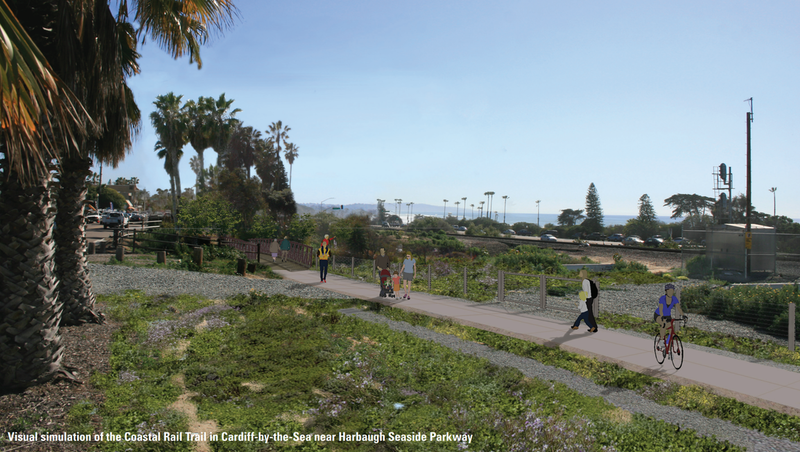 The Cardiff Rail Trail will open up the rail corridor to people of all ages and abilities, connecting residents to each other, to the beach, to the market areas in Cardiff, and to downtown Encinitas (via the pedestrian underpass at Santa Fe Drive). 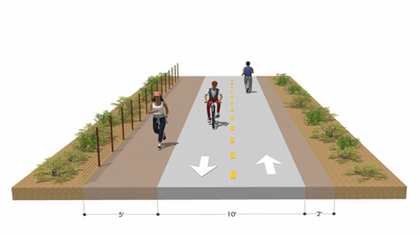 A planned pedestrian railroad crossing at Verdi Avenue or Montgomery Avenue will also provide additional access to the beach half-way along the new trail. 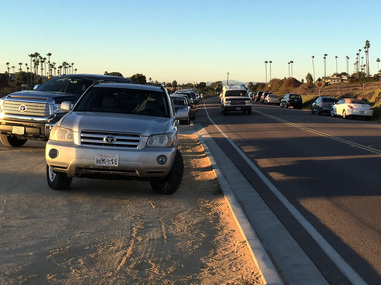 Serious accessibility and safety issues along San Elijo Avenue between Verdi Avenue and Santa Fe Drive will be addressed by the project. It also provides the connective tissue for a complete network of safe and legal railroad crossings through Cardiff. The Cardiff Rail Trail has had a long and complicated history with many changes to the trail alignment over the last several years (detailed in the Blog and FAQ sections of this site). However, the alignment and route finally stabilized for good with a Coastal Commission decision on May 11, 2017. The trail was fully funded by SANDAG (our regional association of governments) on June 9, 2017. TRAIL PLAN: For complete details about the rail trail plan and design, visit the TRAIL PLAN section or hit the link below.